It all begins with french bread. 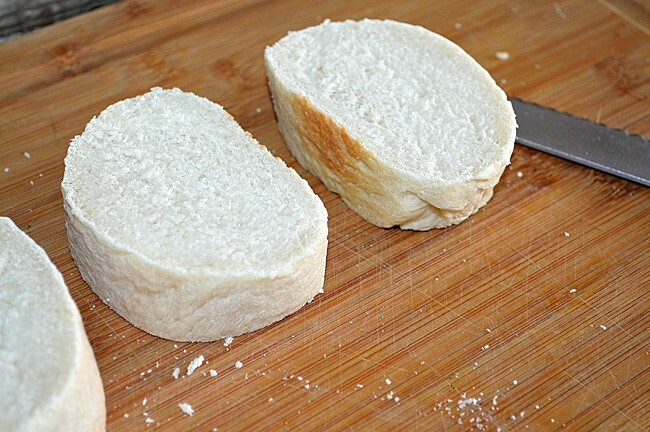 I make my own, but you can certainly buy your favorite bread for this. I make my loaves small, so these are more bite-sized than they appear. Slice the baguette in 1″ slices. Now let’s make the chocolate ganache! So simple. All you need is Coconut (or Soy) Creamer, butter and vegan milk chocolate chips. That’s it! It seems very fluid at first, but transfer it to a bowl and into the freezer for about half an hour. You don’t want it to get too firm, but spreadable in consistency. While this is chilling, onto the hot chocolate! 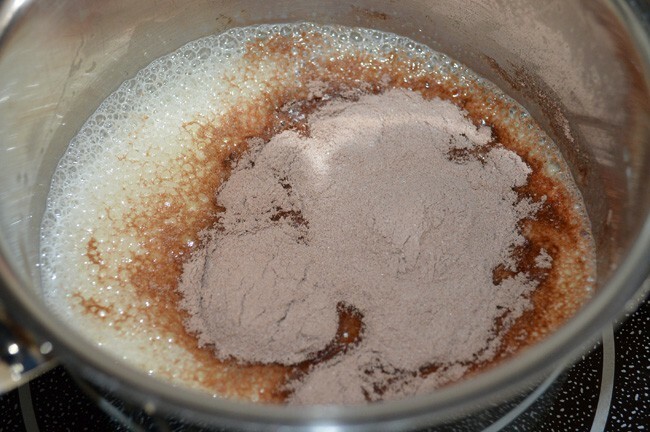 Start with your favorite vegan hot chocolate powdered mix. Mine calls for 3/4 C of almond milk to 3 Tbl of powder, but use the directions for the one you have. Make two servings worth of hot chocolate. To this mixture, add 2-1/2 tsp of Corn Starch and 1/2 tsp of Baking Powder. I first transferred this to an 8×8 pan, but quickly realized it would work better in a loaf pan where more of the bread would be covered. 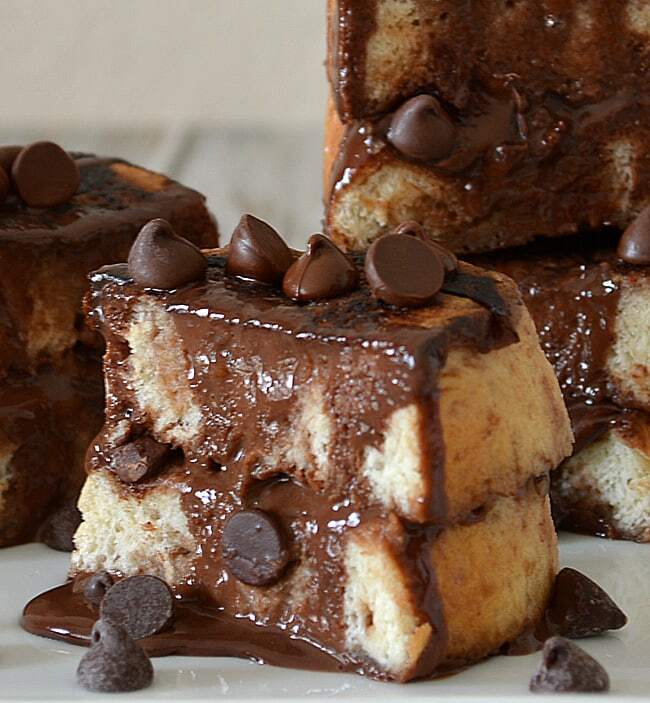 Now slather two slices of french bread with the chilled ganache (and a few extra chocolate chips) and sandwich them together. You want enough so that it will run out when you cut it but not so much that it’s overflowing while the sandwiches are in the pan cooking. I would have used a tad more next time. 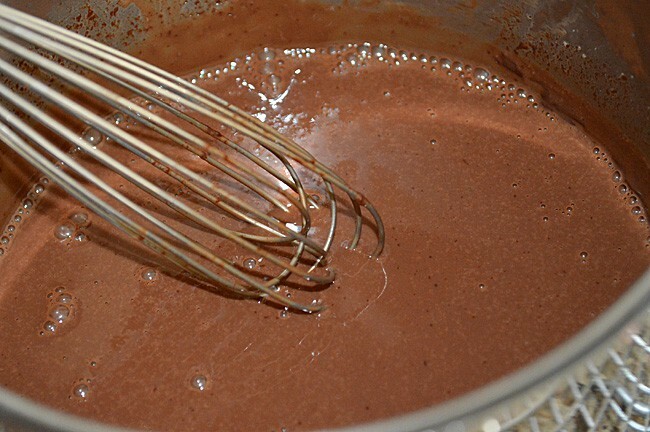 Place into the hot chocolate mixture to soak for about 15 minutes per side. Using a fork, poke some holes into the bread to allow it to seep in and spoon some hot chocolate over every so often. Heat a fry pan with a bit of vegan butter and proceed as you would with any french toast, cooking until each side is golden brown. Transfer to a cutting board and slice in half. 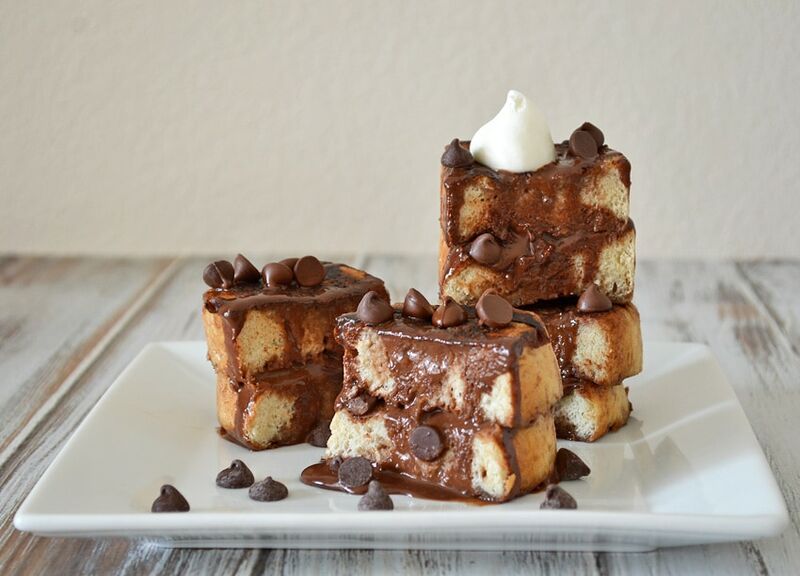 Serve immediately with our coconut whipped cream and a few chocolate chips! For the chocolate ganache, heat the creamer and butter in a small saucepan until warm and add the chocolate chips. Whisk until smooth. Transfer to a bowl and into the freezer until spreadable consistency, about 30 minutes. 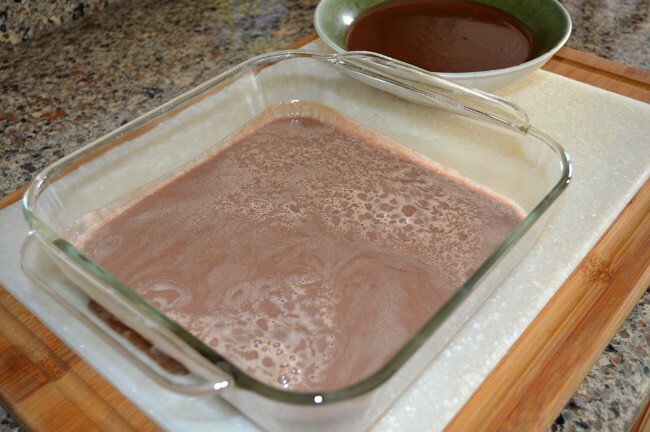 For the hot chocolate, use your favorite vegan hot chocolate made with almond or soy milk heated in a sauce pan. You'll need two servings worth. To this, add the cornstarch and baking powder. Whisk together and transfer to a loaf pan. 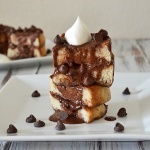 Spread the ganache on one side of two slices of bread and add a few chocolate chips, sandwiching the two slices together. Do not overfill. 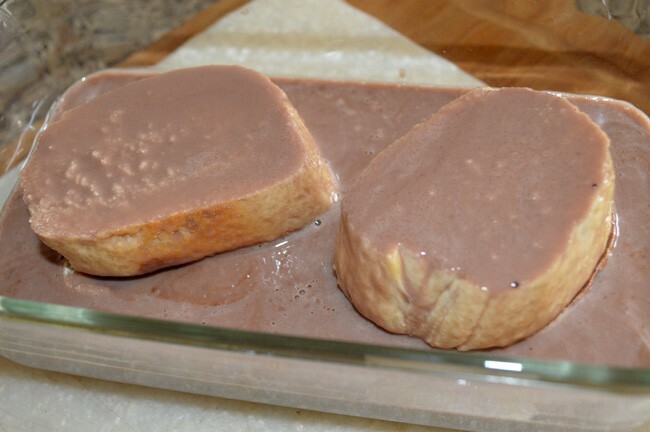 Transfer the sandwiches to the hot chocolate mixture and allow to soak for 15 minutes per side. Using a fork, gently poke holes into the bread to allow the hot chocolate to seep into it. Occasionally spoon hot chocolate over the bread. Heat a fry pan or griddle and add a small amount of vegan margarine. Add the soaked sandwiches to the griddle and cook until browned on each side. When both sides are golden brown, allow to sit on a cutting board for a minute and cut in half. 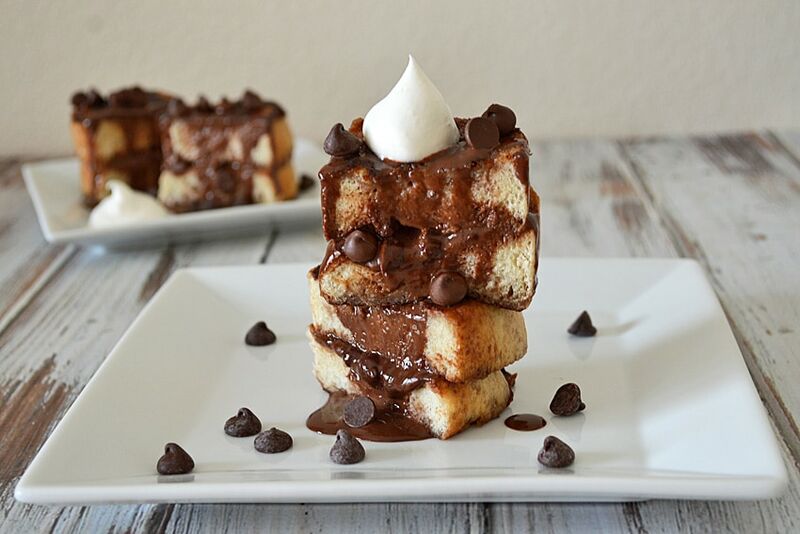 Serve immediately with leftover ganache, our coconut whipped cream and a few chocolate chips.